Hello all! 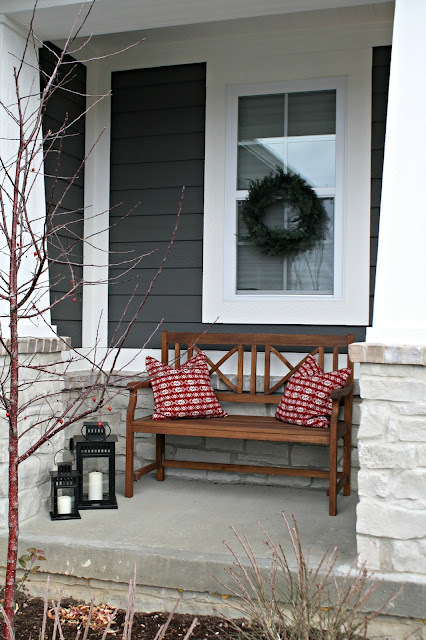 I am SO very excited to share our Christmas front porch with you today! And I'm even more excited that I'm working with IKEA over the next year as we continue to make this new home our dream home! I'm thrilled to be working with them and sharing how I used their items to decorate for the holidays. I've always wanted to have a front porch -- this is just another aspect of this house that makes me giddy. It's not a huge porch, but it's plenty big enough and I've had so much fun decorating it! With just a few IKEA products I was able to create a festive look that isn't over the top. At first I had plans to add garland everywhere -- along the door, hanging from the ceiling, around the columns -- but I soon decided to tone it down using a little greenery and a few items. It doesn't need much to shine! They are a comfy knit fabric and can work all year round -- I think they're perfect as holiday decor! Aren't they pretty" They look so natural. Next year each one will have a red bow as well -- this year I'm just thrilled I got them up so soon after moving in. ;) By the way, I hung each one with a Command hook and so far so good!